today we’re gonna talk about fashion. Fashions for Autumn 1832, that is. 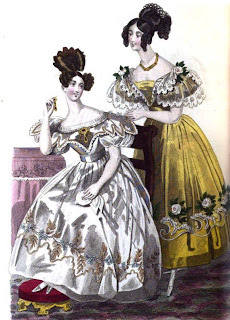 I’ve found some beautiful images of dresses that would have been fashionable at the time and I hope you’ll like them. I have to say I’m not a fan of the huge sleeves that were so popular in that year, but I love the colours of the dresses and the details and ornaments of the skirts. Aren’t they pretty? A dress of rose-coloured satin broché, the corsage is drapé, and finished round the bust with a chemisette of blonde; the epaulettes consist of points of satin like the dress, each terminating in a bunch of five leaves. A row of corresponding points and leaves heads the flounce, which, like the sleeves, is of rich blonde. The coiffure consists of a pink crape beret, trimmed with two alles of blonde; the one within the brim, on the left side, is supported by a bunch of moss-roses; a smaller bunch is placed on the opposite side, mingling with the curls: the second blonde aile is placed above the brim, so that its edge only is seen in front; and another bunch of roses placed over it close to the edge of the brim, completes this elegant head-dress. Collier de perles fines a la Bayadere; earrings and bracelets to match. Satin shoes. 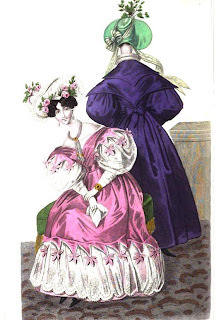 Dress of Parma violet gros des Indes; corsage uni made high, and covered by a double pelerine en fichu, pointed behind and on the shoulders; the ends in front are so long as to cross over the bosom, and tie behind at the waist with a short rosette. Hat of green satin trimmed with a bunch of hops, and figured gauze ribbon. Bottines of kid and green reps; ruff of tulle; light green gloves and gold bracelets. A white crape dress over white satin; the skirt is set on in bunches of small folds; the hem is not very deep, and is cut in scalloped points, edged with a gold tissue rouleau, and surmounted by a wreath of jessamine embroidered in white floss silk with gold foliage. Corsage uni and low; it is partially covered by a deep pelerine of white satin, edged with gold rouleau and blonde; a cordon of white satin and gold rouleaux twisted, with a crape chemisette, finishes it at the top. Coiffure en cheveux, without ornaments. The jewellery should be pearls or diamonds. 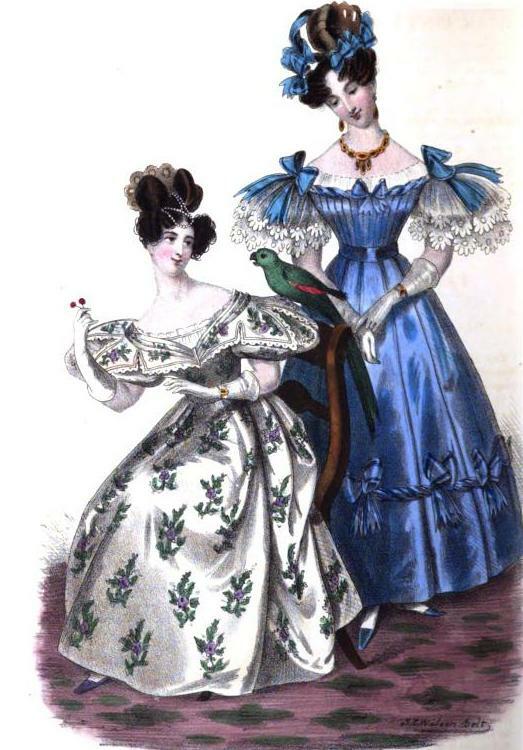 Dress of oiseau de paradis gauze over satin to correspond. 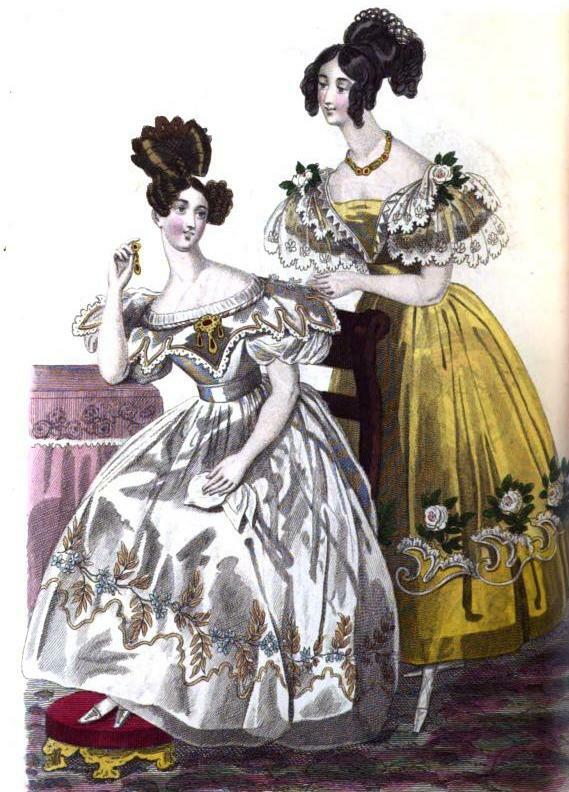 The corsage is very low, cut square and plain, and is covered by a pelerine of blonde open in front, and bordered round the top by a row of satin points; the pelerine consists of two falls of blonde; the first so deep as to cover the sleeves and back part of the bodice, the second less deep is caught upon each shoulder by a white rose. The hem of the skirt is low, and trimmed above with a row of arabesque satin ornaments edged with blonde, each sup porting a full-blown Provence white rose, with a profusion of foliage: the hair is dressed behind in two low horizontal bows, supporting a natte a jour, from which issues a bunch of ringlets Necklace of gold chain and cameos; satin shoes; white kid gloves. This dress is composed of chaly, printed in large sprigs on a white ground. The corsage is cut low en coeur, and plain; a pelerine of a novel form nearly covers the corsage; it has three broad folds, which are fastened down in front and at the back with a short strap; these folds and the pelerine itself are in one piece. Short beret sleeves; the hair is dressed in a simple style, with pearl ornaments. Shoes of satin, of a colour corresponding with the pattern of the dress. Kid gloves; pearl bracelets. Of celestial blue moire; the corsage is very low, and plaited in deep horizontal folds; it is finished round the bust by a torsade of blue gauze ribbon, and a blonde chemisette. Two long bows are placed on the shoulders, and two small ones in front and at the back. The skirt is plaited en colonnes, and is trimmed at the hem with a torsade of ribbon and long bows; a double fall of rich blonde covers the sleeves. The hair is dressed in short curls, with a single large bow behind, and a natte twisted round with ribbon. Coques of ribbon are placed as to form a wreath round the head, and ending with a bow above the curls on the right side, leaving a small open space on the forehead. Jewellery of gold and precious stones. Satin gloves and shoes.